“Calorie” refers to the energy that is found in food we eat. Calories are essential for human life and are in all food to some degree. 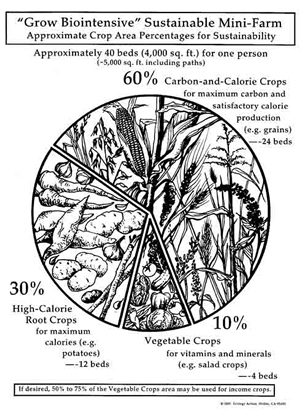 Calorie farming produces a complete diet in the smallest space possible by focusing on special root crops that are calorie-dense and yield well in a small area. These specific crops are: potatoes, sweet potatoes, parsnips, leeks, garlic, Jerusalem artichoke, and salsify. A farm with 30% of its area in special root crops maximizes its area-efficient production of calories and can grow a complete diet in the smallest space possible. sell based on minimizing nutrient loss. Plan to reclaim those nutrients — maybe customers can bring kitchen scraps to contribute to your compost. After accounting for carbon crops and special root crops, the remaining 10% of area can grow vegetable crops for a nutritionally diverse diet and a modest income. Orange and dark green vegetables can help boost important vitamins and minerals in the diet, especially Vitamins A and C and iron. 2: A group of school children find out that harvesting calorie crops is fun! With special root crops, nutritionally-rich vegetables, and the calorie-dense seeds from carbon crops, a complete diet can be sustainably grown in a small area. Remember that the purpose of the farm is to feed people! All farmers are calorie farmers, and smart farmers know which crops produce the most calories in the smallest area, which crops give valuable nutrients, and which carbon-crops produce calorie-dense seeds. Slowly work yourself toward growing your diet in the smallest area possible by adding more of these special root crops into both your diet and your garden.